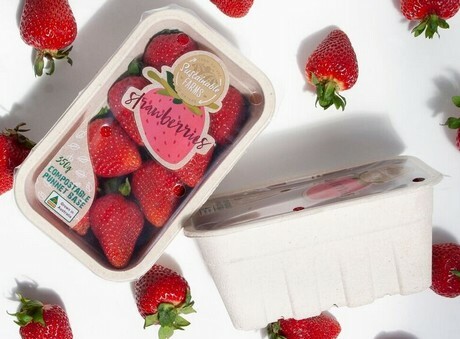 "Fresh Berry wanted to be the first on the Australian market to use moulded fibre packaging,” said Shannon Boase, Director of New Market Development for CKF, Inc. "The Earthcycle™ strawberry punnets were launched in Aldi stores in late August, early September. Fresh Berry have had so much positive feedback from their customers and we are now working on punnets for other programs." Boase added that the Earthcycle™ trays are now also available in the UK, with expansion into continental Europe on the cards early this year. "Earthcycle™ is now in distribution in the UK and the Netherlands, with some stores already carrying them. We expect to also see them in stores in Germany by February, followed by other markets in Europe by the end of Q1. The initial program with Fresh Berry in Australia was only a trial as we have only just completed our tooling at the end of November." 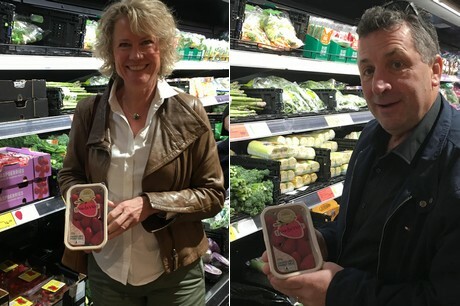 Shannon Boase (left), and John Pettinella of Fresh Berry show off the new Earthcycle™ strawberry punnets in an Aldi store in Australia. One of the keys to making new packaging like Earthcycle™ accepted in the market is to make it easy for companies to switch their current packaging to the new material and new designs, Boase said. This goes deeper than just having the volume of packaging available and easily delivered. Boase shared that CKF undertook extensive research on how the new packaging will fit into a company's existing machinery along with benchmarking production speeds, enabling easy logistical arrangements and everything in between. "One of the fundamental considerations is how we can support commercialization of our material into a mainstream retail program," Boase explained. "A key message we express is that, yes we sell packaging, but even more so we sell change. We have to make our customers feel comfortable with change. Therefore, we remove as many obstacles as possible by doing thorough testing to make sure our packaging fits seamlessly with the entire supply chain. Our goal is proving that our packaging at least matches the shelf life of PET, and in some cases extend it. We also demonstrate that our packaging can run in highly automated environments, matching production speeds of incumbent packaging formats." CKF has been manufacturing moulded fibre pulp packaging products for decades and has applied for the Fruit Logistica Innovation Award in past years. Boase believes this year's successful nomination comes down to the changing consumer landscape when it comes to what consumers want in packaging. "There has been an overwhelming consumer shift in attitude towards plastic packaging," she observed. "Environmentally-responsible and plastic-free packaging is no longer a trend, but is now well established. The nomination for the Fruit Logistica Innovation Award 2019 is a demonstration of this. Growers and retailers have received pressure from their customers to reduce the amount of plastic packaging. A recent study of 7,000 UK shoppers found that that 92 percent would prefer to buy a plastic-free unit of their favourite product than one housed in plastic. Consumers know they have the opportunity to drive change, with more tools at hand than before, like social media." "It's a great honor to be nominated for this prestigious globally recognized award," Boase continued. "This is definitely one of the highlights of my career and is a wonderful opportunity to further change." Aside from the innovation award nomination, CKF will also be showing two of their new designs at Fruit Logistica. One is a shallower version of the EC 3780 strawberry punnet and the other is a tray for hard fruit. "The EC3765 has the same sealing profile as the EC3780, but instead of it being 80mm deep, the new option is 65mm deep, catering to 200-250g of strawberries. The other new product being showcased is the EC480, which is a newly designed 4 count top sealable tray for pears and avocados. Boase added that one of the questions most retailers ask is about visibility. 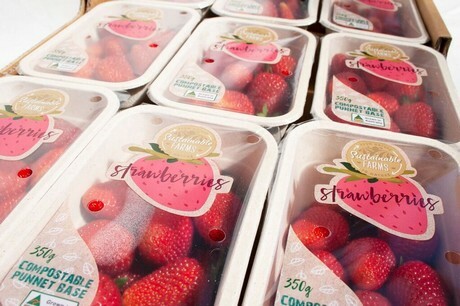 The moulded fibre pulp trays are not transparent, with some retailers concerned because consumers will not have 100 percent visibility of the fruit. She counters this by telling them that consumers understand the reasons behind reduced visibility. "In lock-step with the change in consumer attitudes towards plastic packaging, consumers do understand that visibility comes with a cost, an environmental cost. It comes down to trust in the brand. Nevertheless, CKF has done a lot of work with top seal designers to maximize visibility." "In the end, we know we can't replace all plastic packaging," Boase concluded. "However, there are some areas where it doesn't need to be there and therefore we want to further that change in materials in produce packaging."